"Miracles do happen", race engineer Pete 'Bono' Bonnington told Lewis Hamilton over the radio after an unlikely German Grand Prix victory. Hamilton later said he'd prayed for it, which maybe explains what he was doing crouched down between the front-right wheel and sidepod of his stricken Mercedes with his head resting on it after stopping in qualifying with a hydraulics problem. Whatever he was doing, given this was only the 12th time in 976 world championship races (ignoring the anomalous Indy 500s of 1950-1960) that a driver has won after starting 14th or lower, it worked. 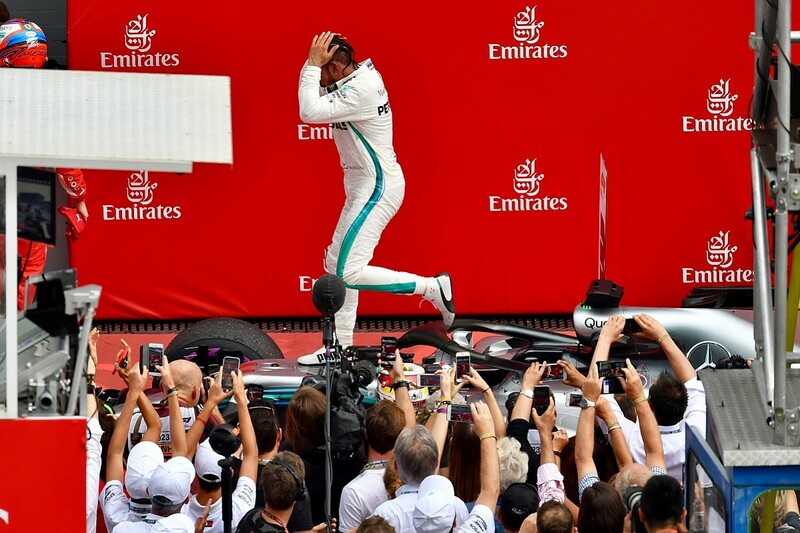 But while divine intervention, in the form of rain and race leader Sebastian Vettel being struck down - not to mention Hamilton walking on water - played its part, this was a victory born of an unpredictable mish-mash of factors. Did Bonnington have a sense of the double meaning when he used the m-word, given it was the confusion he generated over the radio that resulted in Hamilton making the race-winning move by aborting a planned pitstop under the safety car? Probably not, but we can be certain he wasn't aware of the treble meaning it would later be imbued with when Hamilton was investigated for crossing the pit entry line then cutting across the grass to rejoin the track, ultimately escaping with a reprimand. 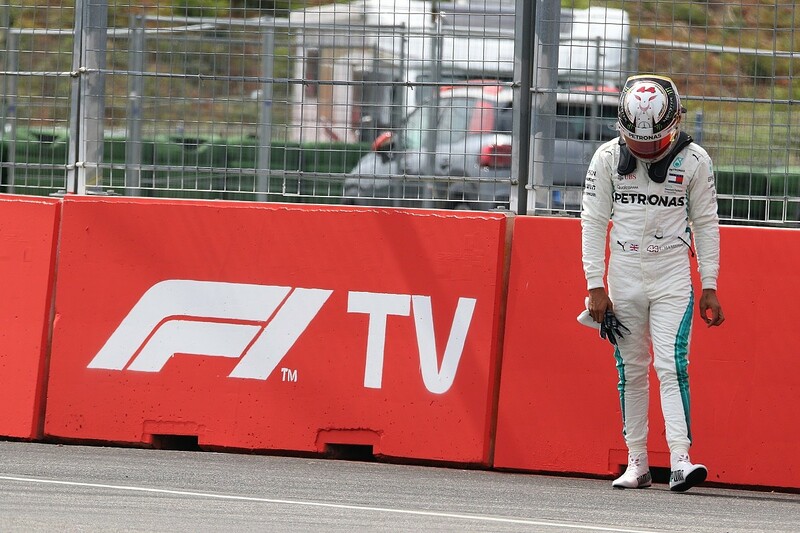 It was a long journey to redemption after the qualifying disaster, which struck during Q1 when Hamilton hit a troublesome bit of kerb at the exit of Turn 1. A lap later, he ran wide at the same corner and had a rough ride returning to the track, forcing the team to order him to stop. It seems the initial strike, which wasn't in an unreasonable place given how the exit kerb is normally used, caused the start of the leak in the hydraulics in the steering. 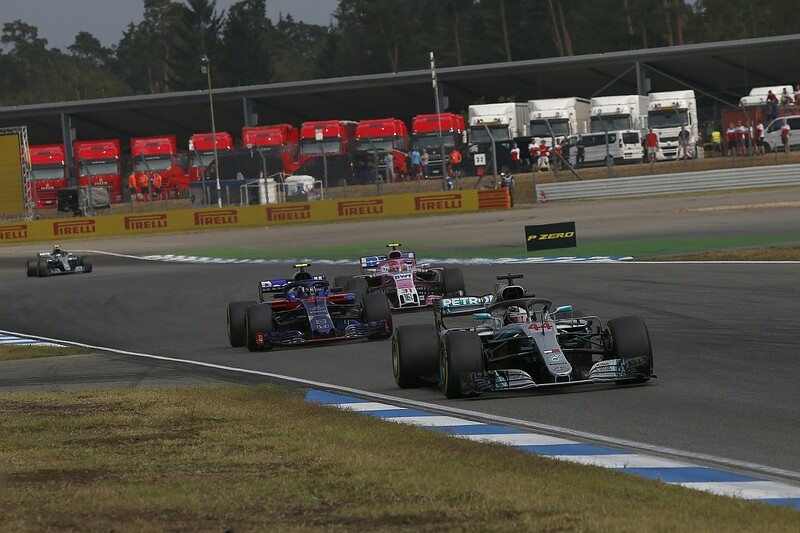 While Sebastian Vettel turned pole position into the race lead over Valtteri Bottas, Kimi Raikkonen and Red Bull's Max Verstappen - building up an advantage of almost four seconds in the first 10 laps, Hamilton had to clear the midfield to get back in the hunt. This he did with ruthless efficiency, albeit aided by the fact the 'class B' runners had no interest in keeping a Mercedes behind for a few extra corners if it cost them time to their direct rivals. Starting 14th, Hamilton jumped Sauber's Marcus Ericsson at the start then capitalised on Sergey Sirotkin running wide out of the fast right-hander into the stadium section to pass the Williams on the run to the Sachskurve hairpin. That put Hamilton 13th, thanks to Esteban Ocon having passed him during the first part of the lap. Ocon was dispatched into Turn 1 on the second lap, with Hamilton passing Fernando Alonso's McLaren into the Turn 8 left-hander next time round. It took only until the Turn 6 hairpin on lap four for Hamilton to climb into the points by dispatching Charles Leclerc's Sauber. Two laps later, Carlos Sainz Jr was relegated in the same place. Hamilton blasted past Romain Grosjean's Haas for eighth on the run to Turn 6 on lap eight, picking off Sergio Perez's Force India at the same spot a lap later. Nico Hulkenberg's Renault fell on lap 11 of 67, leaving only the fifth-placed Haas of Kevin Magnussen between Hamilton and the top four. Magnussen lasted until lap 14, and as Hamilton sailed past the Haas into Turn 6 he was just 25.7s behind Vettel. That made Ferrari call Raikkonen, who had run third throughout the first stint and generally sat 1.5-2.5s behind Bottas and 1.5-1.8s clear of Verstappen, into the pits. He emerged fourth, with Hamilton just behind, but knowing he'd likely committed to a two-stop strategy. During this phase of the race, Hamilton showed his pace. Disregarding the fresh soft-shod Raikkonen, from laps 14-25 Hamilton was the fastest driver on track by an average of 0.458s. Even compared to Raikkonen, he was only 0.187s slower as he closed on the top four. Given the nature of F1 today, this wasn't an entirely fair comparison. Leader Vettel was content to sit on a handy cushion that protected him from any Bottas undercut attempt while Hamilton was pushing on. But it shows how much work Hamilton had to do. Vettel's stop on lap 25 was followed by Bottas coming in three laps later, with Verstappen stopping a lap after that. This allowed Raikkonen to cycle through into the lead having used the pace of his fresh softs to undercut his way past the top two, with a lead over Vettel that fluctuated from 1.0-1.5s. Hamilton moved up to third, with Bottas fourth ahead of Verstappen. 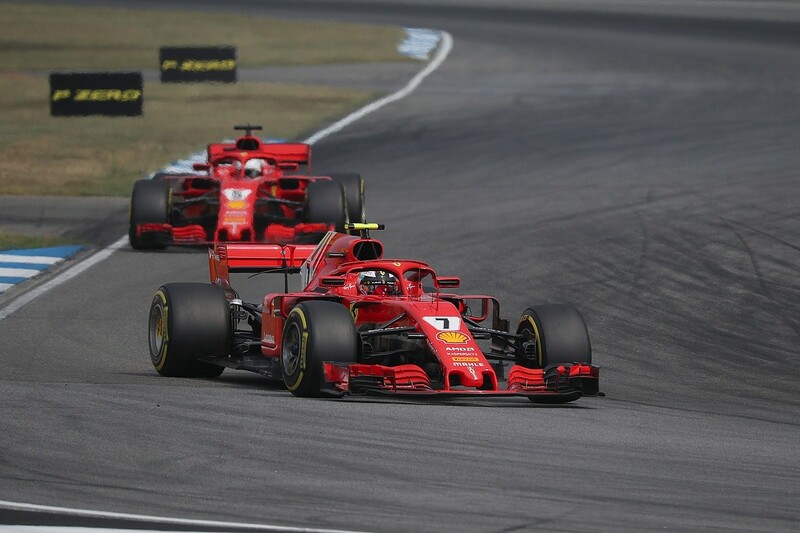 With Raikkonen increasingly considering the chances of making it to the end of the race, which would have required a stint of 53 laps, he obviously wanted to stay ahead of Vettel. But, understandably, Vettel complained repeatedly over the radio about the time loss and the fact it was damaging his own set of softs. "Silly" was how he described the situation amid the barrage of complaints. That led to Ferrari engineering supremo Jock Clear telling Raikkonen not to hold Vettel up as part of a lengthy exchange that featured references to them being on slightly different strategies and that they are both damanging tyres. In common with many of Raikkonen's repsonses to unclear instructions that come with surprising regularlity on his radio channel (more of which takes place than is broadcast on TV), Raikkonen sought clarification and it was obvious the Ferrari pitwall was terrified to be heard issuing an emphatic team order even though it was eminently sensible to do so. Eventually, Raikkonen relented and on lap 39 Vettel breezed passed into the hairpin. In four laps, he pulled out a lead of three seconds. Despite his early attacking drive, Hamilton made his softs last all the way to lap 42. Mercedes was keen to extend this as much as possible, given rain was anticipated. In fact, most drivers had to put up with being told by their teams that rain was five or 10 minutes away pretty much from the start, but Hamilton's miracle looked unlikely when it started to spot with rain a lap after he'd made his stop to take on ultrasofts and rejoined fifth behind Verstappen and Bottas. "I had that long first stint and I couldn't hold on for any longer, the tyre was dead and so I had to pit even though they said the rain is going to come in the next two or three laps," said Hamilton. "I knew I was on a different tyre strategy to the guys ahead, but when I knew there was the possibility [to win] was when it started to rain. As soon as it started to spit I knew that was where the opportunity was going to come." Then the rain came. It was patchy at first, initially hitting at Turn 6, and a few chancers opted to dive into the pits for intermediates. This included, on lap 46, Verstappen who figured it was worth a roll of the dice. It backfired as he lost a heap of time after making a second stop having cooked his intermediates on the dry parts of the track, but he still finished in the fourth place he'd sat in for most of the race with Red Bull not quite quick enough to bother the leaders. At least he finished, unlike team-mate Daniel Ricciardo who started from the back and ground to a halt before half-distance with an engine problem while on course to finish at the back of the lead group. Initially, the rain was good news for Vettel. Immediately, he pulled an extra second on Raikkonen to extend his lead to 4.6s, which grew to 6.6s a couple of laps later. Ferrari gave both drivers the option to pit for intermediates if they wanted to, which they didn't, but Raikkonen's struggles in the damp led to him coming under attack from Bottas, who had been five seconds behind before the rain hit. After Bottas's initial attack, the duo stumbled across a gaggle of lapped cars and Raikkonen was forced wide by Magnussen's ninth-placed Haas at Turn 8. This allowed Bottas to take second place. Hamilton, meanwhile, capitalised on his fresh ultrasofts and ability in these conditions to lap 1.444s faster than anyone on laps 44-51. That put him just 12.2s off the lead. Then Vettel's race fell apart. In sport, a miracle for one competitor often requires a catastrophe for another and with rain still in the air Vettel locked up on the entry to the Sachskurve on lap 52 while nine seconds clear of Bottas. The five double-fisted blows to his steering wheel moments after striking the wall following a forlorn attempt to keep the car on the track said it all. "It was quite a small mistake with a big effect," said Vettel, who apologised to his team over the radio straight after the crash. "I was just a tiny bit too late, locked the front and then locked the rears and couldn't turn in." 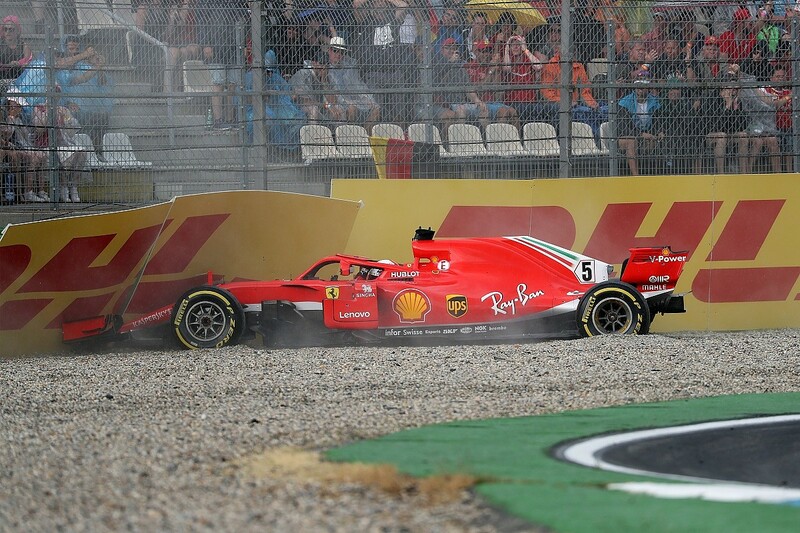 With the Ferrari buried in the gravel, the safety car was deployed. By this point, it was clear the rain wasn't heavy enough, widely enough, to make intermediates work, but there was a chance for a cheap pitstop. Bottas and Hamilton were both instructed to pit, but it took Ferrari an extra lap to debate with Raikkonen whether to stay out. Raikkonen was keen to take the risk because there was nothing to lose, and was subsequently called in - but not until the lap after the Mercedes drivers had stopped. The significance in this was that, as he dived for the pits at the end of lap 52 Hamilton saw Raikkonen staying on the track. "Kimi's staying out," reported Hamilton. Bonnington's response: "No stay...stay on [or did he say out? It wasn't completely clear]...in in in in in in in in in in in in in in..."
"Hey man," was Hamilton's reply. He had taken Bonnington's initial "stay..." as the cue to divert back towards the track, and was already on his way there over the grass by the time of the "in in in in...". Duly committed to staying out, even if accidentally, he was then told simply to go for it. What was clear is that Hamilton was called in, committed to going in and, having pointed out Raikkonen had stayed out, he received a message he rightly described as "confusing". Perhaps his engineer was further distracted by the delay to Bottas's stop caused by confusion over which tyres he was taking? What is certain is that with a small window in which to react and lots going on, the Mercedes pitwall was momentarily overloaded. And Bonnington's 14 'ins' suggested whatever he initially said he was, or at least intended to be, certain that stopping was the right move. "By the time I got in it was 'no, stay out'. It was literally go left, go right. I just slowed down and trundled over some grass and made sure I joined the track as safe as I could." The stage was set for the final 10-lap dash to the flag. 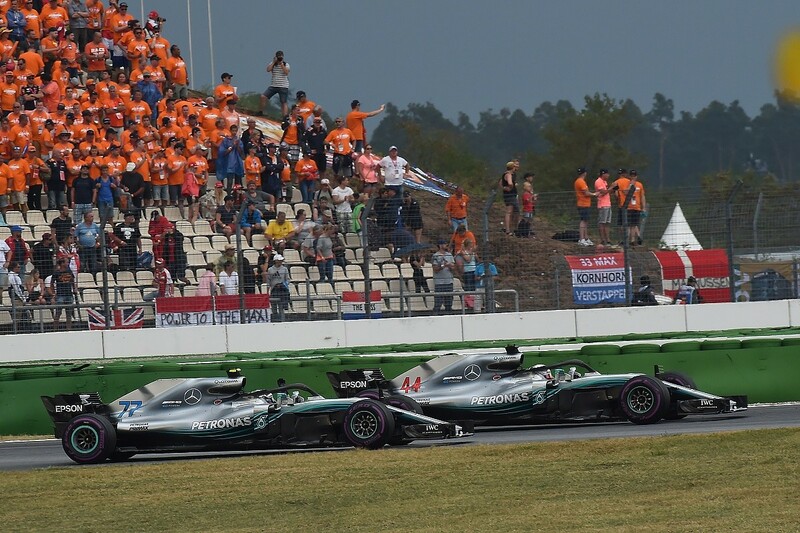 Hamilton led from Bottas, Raikkonen and Verstappen - with Hulkenberg holding the best of the rest position he'd picked up by passing Magnussen shortly after the rain first hit. But Bottas had fresh ultrasofts, which were 11 laps younger. He latched onto the back of Hamilton at the restart and had a look into the Turn 6 hairpin, where Hamilton defended the inside line. A good exit meant he had a handy overlap approaching the fast Turn 7 right-hander, but discretion proved to be the better part of valour for Bottas as Hamilton held firm. "I had no idea how difficult it would be when we restarted, but I was just grateful to have track position," said Hamilton. "I was like 'I've come all this way, there's no way I'm giving it up'. After the brief skirmish, team boss Toto Wolff decided enough was enough and asked chief strategist James Vowles to call Bottas off. He did so apologetically, and Bottas politely accepted the decision both over the radio and after the race. "After the safety car, we were free to race and we had a nice battle on the first lap," said Bottas. "You need quite a big pace difference to overtake and having more or less similar tyres it would have been pretty tricky. We'd have only risked. "From my side, no hard feelings on the [team orders] call. We had the battle on the first lap, and that was that. I had already lost the race before that, the safety car was really bad timing." Bottas is right in that, yet again, the safety car timing denied him a win. He had, after all, battled past Raikkonen and taken the lead when Vettel crashed and it was only Hamilton staying out that denied him and meant he had to be satisfied with a fifth second place of the season. At least he had the solace of a new Mercedes contract, announced ahead of Friday practice, to guarantee him there would be plenty of time to make up for the lost wins. With Raikkonen behind unable to attack, and perhaps smarting because had he been quicker when the rain came or been allowed by Ferrari to stay out he'd have been in front, Hamilton was told to crack on to build a gap. 'Strat mode 5', often heard in situations when strong lap times are needed, was requested by the pitwall but Hamilton said he was keen to save the engine. 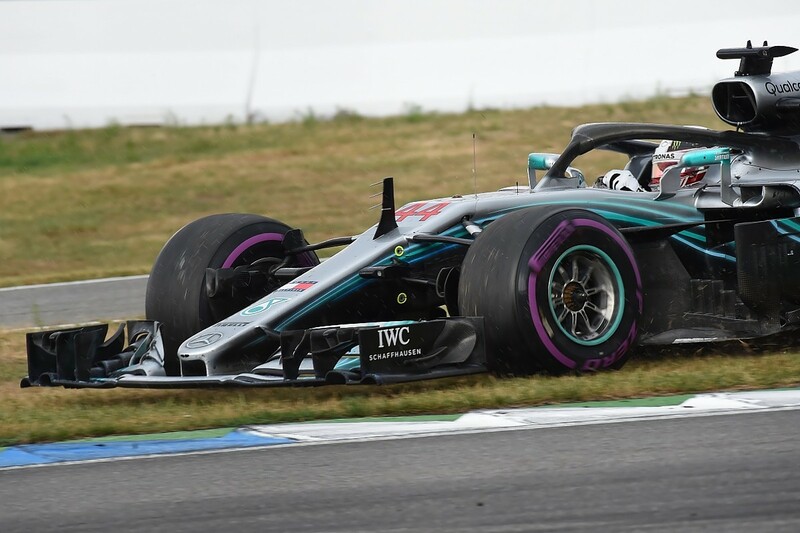 Little did he know Mercedes wanted him to build up a five-second margin just in case his little trip across the grass at the pit entry earned him a time penalty rather than the reprimand he did get. As it was, his winning margin was only 4.535s. But Hamilton didn't really have to worry about that and concentrated on ranking the 2018 German Grand Prix among his best wins. "I've obviously had a lot of races, so there have been other great ones," he said when asked where it stands. "Silverstone 2008 [when he won by over a minute in sodden conditions] was pretty great, but I went off. It was 99.8%! "This one I didn't make any mistakes at all, so I was really proud of today."